Asics Gel Fuji Trabuco 5 are neutral trail running shoes. 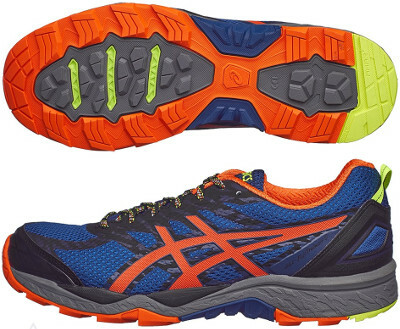 The Asics Gel Fuji Trabuco 5 is one of the classical models within trail running catalogue which evolved better in last years. In the beginning "default" Fuji Trabuco featured DuoMax® medial post for improved pronation support while there was a "neutral" edition without it. But things have changed in current Fuji Trabuco 5 and "default" edition target neutral runners and does not include mentioned medial post. Other remarkable changes are the lowered drop from 10 to 8 mm and reduced stack height to ground. There is a waterproof version with Gore-Tex® (GTX) for adverse weather conditions. Upper presents many changes compared to its predecessor Gel Fuji Trabuco 4 with almost all elements fused but redesigned heel counter and toe cap which are still stitched to breathable mesh. Gusseted tongue prevent debris and dust from jumping inside and includes useful lace pocket to prevent snagging. Without Dynamic DuoMax® medial post, Gel Fuji Trabuco 5's midsole is basically a full-length Solyte® unit for reliable cushioning with not visible embedded GEL® in both rearfoot and forefoot for improved shock absorption and handy rock plate to protect against sharp elements and rocks. Outsole has been redesigned to increase traction on any terrain keeping solid AHAR+ rubber in more exposed areas for great durability.